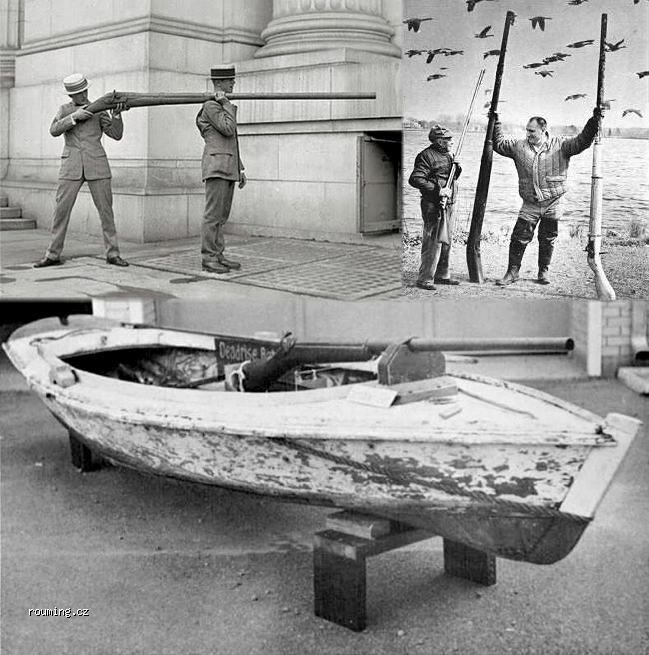 Pictured is a tri-image photo showing punt guns that were used over 100 years ago on the Eastern Shore. Some years ago, myself and a group of duck hunting buddies traveled to Maryland to hunt diving ducks on the Chesapeake Bay. We had talked about it for years and were really excited when we arrived in Saint Michaels and met up with our guide. We would be hunting in boats right out in the open water and would be pursuing ducks that we normally would not see here locally. These included Eiders, Scoters, Redheads, Canvasback, and Old Squaw. We also visited a maritime museum that was filled with great photos and artifacts from the days of commercial market hunting during the late 19th century, and into the early 20th century. The highlight was seeing a boat with a punt gun, old wooden decoys, and various other items used for commercial hunting in those days. The following short story about a punt gun was written by Mark Petrie, Ph.D., who is with Ducks Unlimited's Western Region, and gives great insight as to the use of this weapon for harvesting vast amounts of waterfowl with a single shot. "Rowing alone in the dark, he reminded himself that there was no money to be made on shore. Beside him lay the gun, 200 pounds of well-arranged iron and wood that stretched nearly 10 feet in length. He used it only at night and in a narrow skiff that offered six inches of freeboard in the best of weather....Stowing the oars, he lay prone in the boat. The muzzle of the punt gun rested on the bow, the stock lying on his empty seat. Hanging one arm over the gun, he began to maneuver the skiff using two small hand paddles. The boat's narrow beam allowed him to extend his wrists over the gunnels and work the paddles forward while offering no silhouette to the birds. Face down with eyes closed, he listened in complete darkness. The sound of a thousand canvasbacks diving on the celery reached him. . .In a minute he was among them, cans so dense they covered the water. Pointing the skiff to the spot where the canvasbacks were the thickest, he turned his eyes away from the breech and slapped the three-inch trigger. No matter how many times he went out, he was never prepared for the sound of the gun. Nor did he ever remember the gun's recoil as it slid under his shoulder and came to rest in a bag of sea oats that protected the boat's thin transom. It was only the roar ducks taking wing that restored his sense of time and place. Straightening up, he reached for his lantern and began the methodical work of retrieving the dead birds. It was New Year's Eve, 1911." This tale shows market hunting at its best when it first appeared on the Chesapeake. The largest punt guns had a two-inch bore and were capable of shooting up to two pounds of shot. This would be the equivalent of 25 12 gauge shells. Their effective range was about 50 yards, and depending on the breed of bird being shot, you might bag between 50 and 100 ducks with that single shot. Some boats were fitted with as many as seven normal shotguns that could be fired at one time. The canvasback was the prime eating duck that most market hunters strove to obtain. Prices as high as two dollars per bird were not uncommon. Lesser quality eating birds might only fetch two to three dollars per dozen. Prior to the Civil War, market hunting was almost non-existent. With the advent of the industrial age, that all changed. The American public became more affluent and their taste for game birds increased. Two factors made it possible to get game birds from the marsh to the table faster during this period. An expanding rail system linked all major cities, and commercial ice-making plants allowed birds to be shipped from far away without the risk of spoiling. 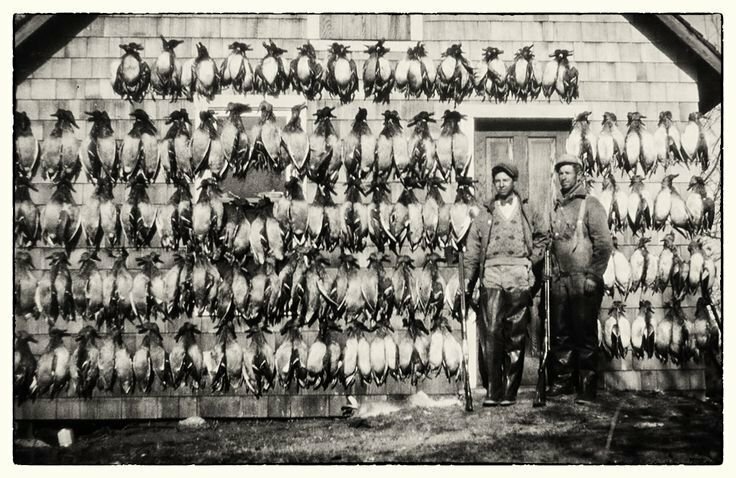 By the early 20th century, sportsmen and groups like the Audubon Society were calling for an end to commercial waterfowl hunting. Many were citing the demise of the passenger pigeon as an example of what could happen to duck populations they felt were dwindling. The government passed the Lacey Act in 1900, that outlawed interstate bird traffic, and in 1913 passed the Weeks-McClean Act, followed by the Migratory Bird Treaty Act in 1918 that virtually ended commercial hunting. One last note: Californian writers Steve Merlo and Mike Griffith were with me on that trip. We had great shooting. The morning we were to leave we drove into Washington D.C. Steve wanted to visit the Vietnam Memorial. I'll never forget him placing his hand on his best friend's name with tears in his eyes. Great memory for me.